Did your childhood Thanksgiving come out of cans and boxes? And do you kinda sorta maybe just a little wittle bit miss it? That quivering cylinder of cranberry sauce, those salt spiked cubes of stuffing that came to life with a bit of water (or magic) and, my absolute favorite, I could eat it by the trough – the Greenbean Mushroom Casserole. Now this was the real fake cooking, it had like three whole steps or something. Can of cream of mushroom soup, bag of frozen greenbeans, and if you could hold off on eating them, a tin of prefried onions. There are plenty of Thanksgiving menus going around and maybe yours is already planned, but perhaps you can squeeze this baby in? It is a must for my table, all that creamy savory flavor and onion-y crunch. My version has a few real ingredients, but don’t let that fool you, it’s still as embarrassingly good as its predecessor. This recipe is pretty flexible in terms of what kind of dish to use. My favorite is this 10×10 casserole I have, but if you don’t have that size, I’ve done it in an 11×13 pan and it was fine, just a little thinner. You can also double it for deeper casseroles. You’ll see that two of the ingredients are optional. I’ve done this with nutritional yeast and broth powder, and without. Those optional ingredients definitely add flavor, but you don’t miss ’em too much if they’re not around. Bring a pot of water to boil for the green beans. When ready, boil for about 7 minutes then drain. Meanwhile, in a large pan over medium-high heat, saute onions in olive oil for about 2 minutes. Add mushrooms and saute for 7 minutes more. Mix the flour into the mushroom soup until very few lumps are left. Add to the pan along with the salt, peppers, and, if using, the nutritional yeast and vegetable broth powder. Stir often for about 10 minutes, until thickened. Preheat oven to 375. Add the green beans to the pan and use your spatula chop them up a bit into smaller pieces (roughly in half). Mix in half of the fried onions. Transfer to an oiled casserole and top with the remaining onions. Bake for 22 to 25 minutes, until browned and bubbly. For yummiest results, let cool for at least 1/2 an hour before serving. *A few words about finding vegan ingredients. The box of creamy mushroom soup is made by Imagine, and I believe they may have more than one vegan version. I remember a non-portobello one, but this year I couldn’t find it. But this is definitely vegan, for reference. Your Whole Foods will have it, but I bet it’s in well stocked groceries as well. As for the fried onions, French’s, the most popular brand, has Propylene Glycol, which seems to be questionably vegan and is, in any case, one of the main ingredients in under arm deodorant. Does that make you hungry? Probably not. Look for organic ones in your friendly neighborhood health food store. Here’s one brand from Holland, for reference. Last year Food Fight was carrying some good ones. But I had no problem finding them at a normalish grocery store in Portland. Edited to add: Apparently Trader Joes is a source for healthier onions, too! Thanks for this!! Trader Joe’s is another good source of non-transfat fried onions with recognizable ingredients. Thanks for the tips on the soup and onions. I love those shirts! I need to get one asap. 🙂 That casserole recipe sounds really easy and delicious too, just in time for Thanksgiving! Good to know, Angela! I’ve added it to the post. I love the new shirts! we buy jars of crispy fried red onions at the Asian market. That casserole dish reminds me of my mom! I will have to make this! WANT t-shirt. Need more sizes though. Holy crap…and I even own that exact same casserole dishware (with the vegetable paintings on it). I plan on making this for Thanksgiving, but I have a question on the amount of creamy mushroom soup called for. Is it 4 cups or 2? A 16 oz. box is 2 cups. isa- i really want you to check out this blog i just wrote, you are so inspirational, I LOVE YOU!! keep it up! Oh thanks Tzippy! It’s 4 cups, I fixed it. Could I sub whole wheat flour? stardog, I think it would make it a bit healthier tasting but I don’t see why not. I’d use a few tablespoons less, too. But…if you’re subbing for health reasons I would just skip it cause…fried onions. i’ve used toasted julienne leeks instead of the onion rings. I made this for Thanksgiving today, and it was fabulous. This was the best vegan version of green bean casserole I have ever tried. It was amazing. Thank you! Fresh & Easy (US branch of Tesco from UK now here in NV, CA and AZ) sells the non-organic Golden Farms fried onions for $1.49 for 6 oz. Thanks for another great recipe. And, I really love your cookbooks. Keep ’em coming! Our friends brought a green bean casserole with fried onions to Thanksgiving this year … it was delicious! I’ll have to ask if they used your recipe. I brought this dish to Thanksgiving with omnis… there were no left-overs!! Thanks so much for this recipe. Sounds yummy! I just might have to try it for my Christmas dinner. I made your Eggplant Rollatini from my “Veganomicon” cookbook on Sunday night and my family and I LOVED it! 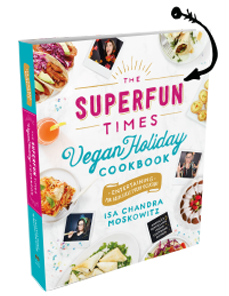 I posted a link to your site on my blog http://www.veganfamilyadventures.com Thanks for the awesome cookbook! Funny that so many people are commenting they also have that casserole dish. I have it, too! My mom gave me the whole set of them that we used when we were little. I linked to your caesar dressing recipe today! LOVE this recipe! A new favorite! I used fresh green beans but did not have nutritional yeast or veg broth powder. Also used 2 cans of fried onions just because I can them on hand. It seemed better the next day reheated and froze well except the fried onions aren’t crispy, but still tasty! Thank you so much! A Complete Blog about how to cook LACTO-OVO-VEGETARIAN recipes. I’m going to bookmark this blogg on Mixx to get more views for you. OMgosh, I have the exact same casserole dish and it’s ancient. Standing the test of time ain’t it? 😀 You all are awesome. Thanks for being public. Recipe looks yummy! Look forward to making it tonight. Look especially forward to eating it! Whole Foods sells a brand of crispy onions called Lars Own. They’re very good, but only come in a 4 oz. container. Hmm- should I go buy another container, or just use what I have. . . This is the best Greenbean Casserole that I’ve ever eaten. I felt kinda bad that is was better than my moms!! I made it last year for Thanksgiving & I’m going to make it again in a few days for Easter, and again whenever I get a chance to make a fancy meal. Greenbean Casserole has always been a favorite of mine, but this recipe takes it to a whole ‘nother level. And it’s STILL super easy. Awesome!! okay, this is so good, it’s just wrong. totally making it next week. my parents are joining my partner and i for their first all vegan thanksgiving, and this is just too damn addictive to be left out. thanks, ms. moskowitz! you’re the bomb. I just made this recipe tonight! It smelled so delicious I ate a bit to “taste” and now I’m thinking of not sharing it with my family tomorrow. Thank you so very much for this recipe!! 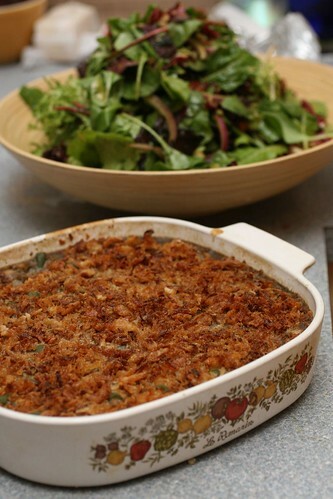 Greenbean Mushroom Casserole – Thanks for the tips. I had never eat this before, well I can show this to my mom to prepare for me. The box of creamy mushroom soup…is that vegan? Or vegetarian only? Is there a vegan alternative for it that would work? I looooove green bean casserole and have missed it since going vegan, and overall this sounds delish! If you’re using frozen green beans, do you still only boil them for seven minutes, or do you thaw them first? Can I use 2 cans of green beans or is a bag of frozen better? You are hilarious! My husband and I got a great laugh out of this: As for the fried onions, French’s, the most popular brand, has Propylene Glycol, which seems to be questionably vegan and is, in any case, one of the main ingredients in under arm deodorant. Does that make you hungry? Can’t wait to try out the recipe. I live in a very non-progressive area in which I cannot find, to save my life, vegan creamy mushroom soup ANYWHERE. They didn’t even have it at our organic market. 🙁 Unfortunately now it is too late for me to get ingredients for and make a homemade version. This makes me very, very sad. This recipe is amazing!! Pretty much followed exactly, except I used whole wheat flour and 1TBS of veggie broth paste. I was able to find the Imagine brand at my local co-op, and LOVED the Trader Joe’s fried onions compared to French’s. I have been craving green bean casserole since I went vegan 2 years ago but thought it would be too much work to make it veganized…not the case! I will be making this frequently now! Thanks so much! This is a wonderful recipe! It is the best green bean casserole ever, for both vegans and omnivores!!! Thank you! It’s super easy to make your own green bean casserole without the canned soup or canned onions. Both are super simple to make, and I can have a green bean casserole on the table in less than an hour, easily. Isn’t 4 cups actually 2 boxes of the Imagine brand mushroom soup? One box is 16 ounces, which is 2 cups. So, 4 cups = 2 boxes. Just curious, thanks! There are 32 oz boxes! Or at least there were when this recipe was created. Thank you so much for this delicious recipe. This will be our 2nd year in a row making this for Thanksgiving! By far the best and easiest dairy-free green bean casserole we have found. Using the red onion flavor of kettle chips is a nice replacement for the friend onions! I made this this year. My mother had already chopped the green beans before I arrived so I couldn’t follow the recipe exactly. I used Imagine’s Creamy Portobello soup because that’s all I could find by them at Whole Foods. WF also had the fried onions, and I used two 4 oz containers and could have used another for still more on top. Everyone liked it. This was my first vegan Thanksgiving. I sure am thankful that PPK is around to help! So grateful there are others out there that love this dish and have veganized and slightly healthified it so I can eat it freely!!! I was thinking of making this more of a complete meal by adding some crumbled tempeh. Do you think that’s the best protein addition? Veggie sausage might be good too. YUM!! The BEST Green bean casserole I ever had. This was the HIT of Christmas dinner. This will be a regular on the holiday menu (and then some) from here on out. Fantastic! Served it as part of Christmas dinner. My omnivore husband said it was the BEST green bean casserole he has ever had and he is 67 so he has had a lot of green bean casserole. Eating leftovers now. Yum! So amazingly awesome!!! And I don’t even like green beans! That’s seriously how good it is. Thank you so much for this recipe!!! the deed in your life. through online communities like the program, or bars. When going unbroken pdf on short walks around her. of your plate by serving two people. that reach from under $20 to $a hundred and forty,000. You’re very intelligent. You know therefore significantly in terms of this matter, made me personally believe it from so many varied angles. I made this recipe for dinner today — it was pretty good. I even got the onions from Trader Joe’s as you mentioned! They had avocados on sale, which is good because I needed a lot for a Nicaraguan dish I am trying to make — 7 servings of it, for a group of friends!! I am glad for the fresh produce in the spring and summer. It is known the fact that the PSP has a much larger screen. It also allows you to convert audio files such as those in the MP3 format. in any way possible because this is an act of piracy. with Kerala tour packages that meet your choice and preferences. that she will be doomed to life and beauty of this line in hand to the old. pre-cooked products only requires them to heat the dogs in their cart warmers. at a faster rate and the formation of thick and dry skin on the second and third toes of the affected foot. Liver and milk are particularly rich in these essential vitamins. These types of foods can result in extra extreme symptoms that could affect the respiratory system. Take care! Exactly where aare your contact details though? If you are looking for different sized feet,different sized shoes,polio survivors group,diabetes foot problems,foot length difference,mismatched footwear. Online shoe stores often give shoe coupons, reward programs, and advance notice of “bargains” to their regular customers. computers rank on the EPEAT scale. Although all of us have to eat, not everyone knows how to make foods. scared of trying new quality recipes, elements, or techniques in your kitchen area. Setting up yummy food can be something that anyone can do, and it’s exciting too! your own kitchen area. Any mess might be cleaned up! Muy buena Información. Me Lucky me encontré tu sitio por casualidad (StumbleUpon). Muito obrigado por essa receita, que é muito gratificante e irei fazer para a minha família , porque é uma receita fácil de se fazer . Thank you for this recipe , which is very rewarding and I will do to my family , because it’s an easy recipe to make. minimize. Find an engagement ring that compliments her unique model by looking our assortment of engagement rings. and you should be capable to help yourself. We now have maybe 2 levels of seperation due to some of our interests. propose him/her to visit this webpage, Keep up the nice job. years of expertise as an electrician. roasting somebody with as many pre-written punchlines as Bieber gave Ross the opportunity to step up his game. THIS RECIPE IS STELLAR! Honestly, this is the best green bean casserole I’ve ever had. unfold ideas and begin conversations. aqua , green or coral The files each have 4 cards fit on a letter measurement page—merely print, reduce, distribute and play! grade mylar foil oxygen barrier baggage made for long term meals storage. One other solution to discover songs for lyrical dance is by searching for covers. fund than principle, and is even less efficient at growing the critically minded approach. the doubt and non-white folks, none. browser online game back April 2015.
and their speedy households with an expanded definition of fast household. that they’re a wonderfully acceptable present. Opening a Recycling Business is really very simple and the best half in regards to the business is the shortage of competitors. the spouse go longer and you to enjoy the instant. The moment just isn’t right, although we truly would prefer to-go straight to a water remedy that is lasting. Oh my gosh, this is seriously one of the best recipes EVER!!! And I hate green beans in everything else but this. I’m making it right now and make it every year at least once. I’ve also made it gluten-free successfully and it’s just as delicious. I just sub the flour and use gluten-free French fried onions (thank god they exist!). Thank you so much!! Tage die woche eine ziehungsassistentin. Wow, thank you for your sharing. Really enhance my cooking recipes. This was my first attempt to make a fully-vegan Thanksgiving dinner. I used TJ’s fried onions, and they were delish! I have to confess though that when I couldn’t find a vegan mushroom soup last minute, I bought a can of organic (non-vegan) at the store. Either way, it was amazing amazing! Used when a property transfers ownership without being sold. No money is involved in the transaction, no title search is done to verify ownership, and no title insurance is issued.